Well tonight i finally had a pier crash that really jammed up the entire imaging system ( mount, focuser and camera) . My set up is on a permanent concrete pier and while i was close to the meridian i selected a new object and expected the limits in EQ mod force the mount to slew around the meridian and center on the object as it has done hundred of times. When i could not get the object to plate solve i went out to the mount and oh my was the scope jammed up upside down with the camera and focuser pinned very hard against the pier. Motors were quiet and no sounds coming from the mount. I unlocked the clutches to release the imaging train from the pier. When i tried to slew the scope both motors were rotating and the scope moved in both axis but sounded terrible. The moonlite focuser has play in the drawtube. How do i attempt to correct the issue with the focuser? 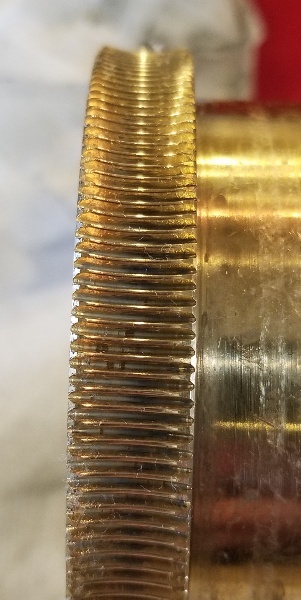 Is it likely the tube is bent or is this something that can be adjusted out. Not sure where to even start here, any recommendations are welcomed.... I guess i will reach out to Moonlite tomorrow for their recommendations. Hopefully this is just an adjustment that is needed. Now on the mount, is the expectations that the motors are both bad or is there any chance to save them? I have a rowan belt mod on the RA access which expect at least stripped out the belt. The DEC access has the standard gear driven axis and was not converted. Not sure how strong the motors are and is there potential issues with the metal gears or does the motor just stall and eventually quit running during a crash? I have another exact model of this mount so i have spare motors to swap out, but wanted to get some recommendations as what to expect. I am a complete loss at how the mount did not recognize the EQmod limits and continued to go past them and hit the pier. Edited by flyingg103, 24 January 2019 - 01:52 AM. Yeah, sounds rather grim... I've done far worse, with almost no damage to equipment. After that, I reconfigured with at least three layers of safety on everything I could think of. And the good, old-fashioned just watching (in-person or remotely) while the scope and dome are slewing. My new scope is a light-weight 36-incher... svelte 450 pounds. I hope you get it sorted without too much expense, and I don't want to be the guy retrospectively offering "advice" that isn't going to fix your damaged gear, but wouldn't looser clutches have prevented that extent of damage? I also don't entirely understand what the hell EQMOD is doing sometimes, but I figured if the clutches aren't over tightened it's unlikely that a pier crash could be catastrophic. I feel your pain. I had a nasty experience last year with my Paramount MX+ during a time of brain death I slewed the mount when it was 22 lbs out of balance in the RA axis. 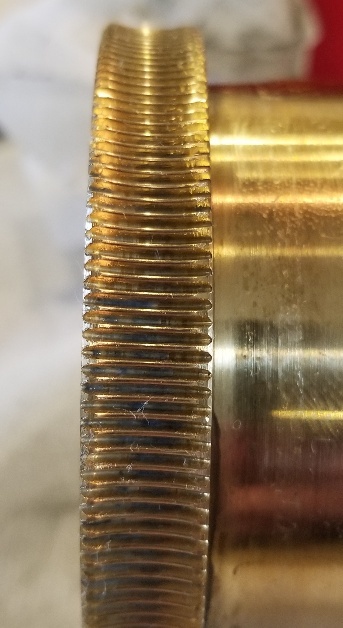 Gravity forced the OTA down at high speed and the RA axis went through the mechanical hard stop and the axis was "trapped" on the wrong side of the hard stop. This caused $4000 worth of damage to the mount and motors. Not a very nice experience. I am now much more careful with what I do- I can't afford this amount of damage to happen again. Whilst we learn from our experiences I am always mindful about the unforeseen that has the potential to trip us up. I think you did everything right & had an expectation that the slew limits would be effective but somehow failed. Could it be that the mount thought it was in a different position & that's why it carried on slewing into the pier?- I've had a few weird issues in the past where my mount has lost its position but the Paramount will immediately stop if it encounters any obstruction. Good luck with getting the issues fixed & I'm sorry for your bad experience. Sorr y to read this, most unfortunate. The focuser has probably just been forced out of adjustment and it should be possible to readjust it. I have a similar mount, an unmodded Skywatcher EQ6 Pro, on a couple of occasions I have absent mindedly left it running resulting in it jamming against the observatory wall for a couple of days. On each occasion the mount has subsequently worked perfectly once released leaving me to suspect that there must be some sort of motor clutching feature. Hopefully your problems won't be as bad as they currently seem. Call Ron At Moonlite. Worst case he’ll take it back and work with you to fix it. It shouldn’t cost an arm and a leg. I like raginar's suggestion. Hopefully Ron will tell you that you just need new bearings in your focuser. I think the axles in the bearings are the only parts in a MoonLite focuser small enough to be damaged by your mount hitting the pier. The Atlas is not a difficult mount to disassemble and adjust. My first thought is having the mount crash against your pier would have burned a motor out, but you said the motors move the mount, but it sounds terrible, so I don't think your motors are burned out. Therefore, my suggestion is take your mount apart and see if there is any damage to the gear train and readjust everything. Perhaps that will be enough to get your mount back to proper operation. No advice from me here, I don't use EQMOD. Lots of CloudyNighters do, though, so I'm sure you'll get some good advice soon. Maybe the simplest thing to do is install a camera in your observatory that gives you a view of your mount. That way you could watch it remotely while it's slewing. My $0.02 in red above. Good luck to you. When slewing to unknown or dangerous positions i always keep my finger on the power switch to cut the power when things go wrong. If the motors still move the mount, then it is unlikely to be a motor or electronics issue. What you are likely hearing is the stepper motor(s) skipping which makes a terrible sound. What has probably happened is one or both of the worm housings have been shifted so that the worm is now jammed against the ring gear. This is particularly likely since you have had the RA axis apart to install the belt mod previously. All that you probably need to do is adjust the worm spacing and things will be fine. You can find instructions for the adjustment here: https://www.deepspac...ustment_New.pdf. As an earlier poster noted, do not overtighten clutches, particularly on mounts that do not automatically stop when they encounter an object (which includes the majority of mounts out there). Clutches should be tight enough that a slight bump will not move the axis while loose enough that should a collision occur, the axis has a good chance to slip rather than jam. This is particularly true with the mounts like the CGEM that use servo motors. Unlike the stepper motor system in the Atlas, the servo motor system in the CGEM will continue to ramp up the power to the motors in and attempt to break free and this can lead to breaking of the gears in the motor gearbox or burning out the motor (the preferable faults) or burning out the electronics (the worst outcome). This morning i tried slewing the scope and it appears both motors are working and not stalling. I was getting some binding in the RA axis so i decided to pull it apart to confirm if anything looked out of the ordinary. I inspected the ring and worm gears for both axis all looks ok to my untrained eye. Once everything was cleaned and regreased everything seems to be ok with the mount. I did revisit the EQMOD limits and everything was still where I last left it. I did reduce the limits a little further and tested to make sure once hit the mount parks once the limit is hit. Clutches are not so tight anymore which is a good suggestion. Now looking for a IR camera ( where i can turn on and off the IR lights) so i can install to keep an eye out during slews. I do not have an observatory, rather just the pier with a TeleGizmos 365 cover. The camera would be installed on the eave of the house to monitor. If anyone has recommendations I am all ears. Now the focuser is another issue. 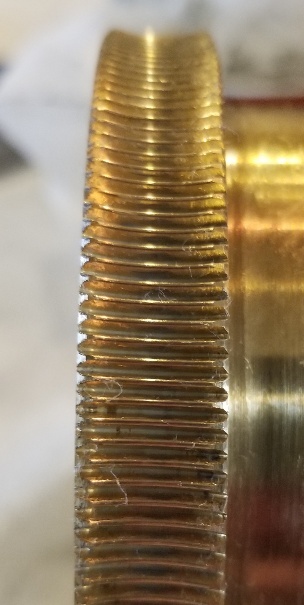 It appears based on conversation with Ron from Moonlite ( who is GREAT to work with by the way), the bearings in the focuser were damaged causing the flex in the draw tube. Apparently there is an upgrade to the 2.5" refractor focuser housing that provides heavier load capabilities as well as larger and more stout bearings. I packaged up the focuser and sent on to Don for repairs. So at this point everyone can thank me for the clear nights as it will be a week or two before I will get back out to test how everything is working now. 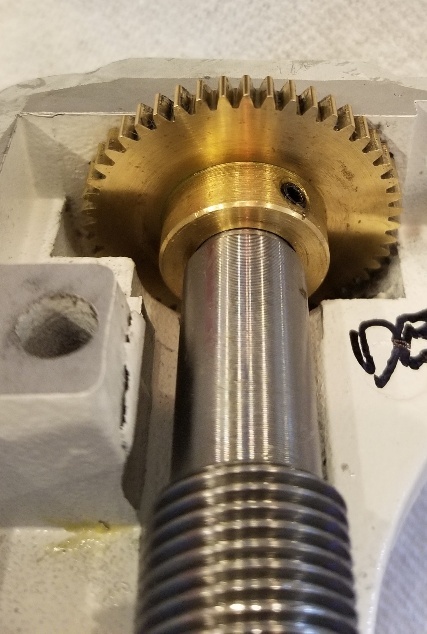 Attached are images of the ring and worm gears, which to me seem ok, but is anyone sees anything that is suspect I am open to ideas. Fingers crossed I avoided a lot of damage, will update once everything is back and I can do some testing. Edited by flyingg103, 24 January 2019 - 05:47 PM. The only thing i can think of with the mount thinking it was in a different part of they sky would have been a stop slew command ( ctrl 5) that i made before the incident. I have done this many times in the past and the mount just stopped where it was but did not get lost. Maybe something happened with this command that cause the confusion. Thanks Ed, i have to say that I have been WAY to heavy handed with the clutches. I had been making them as tight as i could get em......not anymore. It was a hard learned lesson learned. Yes regarding clutch tightness I have also read that the other advantage of leaving them somewhat loose is that overtightening puts enough pressure on the bearing to force it a bit out of round and reduce the tracking/guiding accuracy. I found one of these cameras from Amcrest to work well and is has the ability to turn the night vision on and off which is important (and a little hard to find). https://www.amazon.c...e?ie=UTF8&psc=1. I think that they have some less expensive versions as well. We have one installed up in southern Utah for a remote observatory and it is great for checking to make sure there are no issues. Thanks Ed, found this one and will setup next week. Oy ... pier crashes, no bueno! Great advice from Ed about the clutches, I'm going to do that! I have a thermal management RaspPi on each OTA that handles the heaters and is also tasked with providing a watchdog for the mount. What I've got is the 12v power going into the mount goes through a relay controlled by the RaspPi such that the RaspPi can kill the mount power based on a limits test as well as external temperature. The temperature is so that I don't try to run the mount below 20F to save the motors, the mount limits is so that the mount won't go crazy and slew itself into the pier. How do I check the limits? The good point? The motors are unlikely to be bad. They are steppers and not susceptible to being killed by accidents like this. Check the belt, gears, spacing, and tensioning and reset as appropriate. I would not rely on EQMOD to save me in an instance like this. Always keep an eye on the mount, and a finger ready to stop the move in a potentially dire situation. But that's just my experience. Wow after reading this I'm so glad my big mount has slip clutches or both ra & dec .. I would not want to repair and or replace equipment due to a slewing error or lack of meridian flip. How does a scope hit a pier? Not to be obtuse, I have heard a scope hitting the tripod legs, thus people buying a mount/pier extension. I'm confused how a scope would hit a pier...can the RA or DEC actually move the scope to such an angle? Would this be possible if the scope length is very long? Just trying to picture it in my mind is all. If you have your scope pointing to an object near zenith and you slew past the meridian, the bottom of your OTA can hit your pier. It can also happen with the front of your scope if you have it pointing straight at the ground and you slew far to the east or far to the west. That happened to me once when I was observing the Mole People. How does one prevent this? I have a CG5-ASGT Mount. I know about the Limits that I can set but is there something in the Hand Control Settings that I can set besides limits such as for a Meridian Flip? Sorry, not trying to Hijack the Post. I was wondering because at one point I set limits due to my long refractor and that worked fine ast it would stop at the limit set, however I did purchase a Mount/Pier extension so as not to use the Limits I set. So is there something in the Hand Control (fully updated Firmware to latest version) I am missing so as to perform a Meridian Flip automatically in the Settings? Curious to hear from those Folks who have the CG5-ASGT Mount and what you have done or set in the Setting to prevent a pier crash. 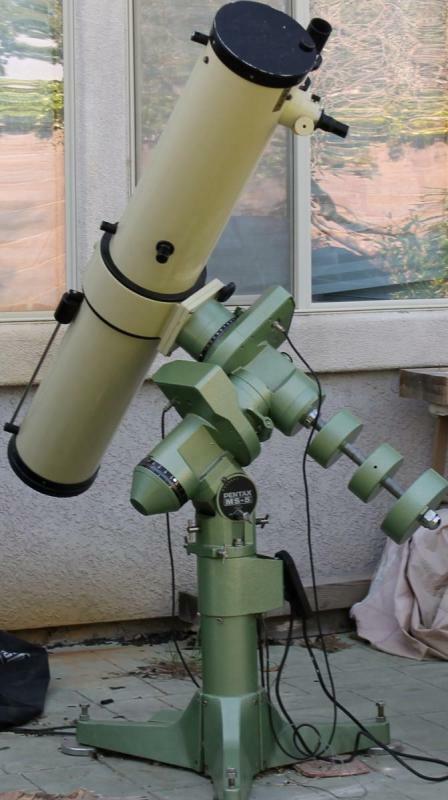 I know that I can move my scope straight to the Zenith and Meridian without the scope hitting my Mount/pier because of the Mount/Pier extension I added but what is the best way to prevent the "beyond Meridian" Mount/Pier crash? Does the Firmware have something automatic where it realizes the scope is at the Meridian and will go a bit past then slews to the other side of Meridian? Edited by emflocater, 26 January 2019 - 04:23 PM. I have had this mount for over 30 years and there were plenty of times I forgot to shut off the power and would come back the next day and see it pointing in some odd direction but it never hit the pier, I do not see how it could. "I have had this mount for over 30 years and there were plenty of times I forgot to shut off the power and would come back the next day and see it pointing in some odd direction but it never hit the pier, I do not see how it could." With your system pictured the scope would have to be pointed 30-40 degrees south of the zenith then the end of the tube or the focuser might come into contact with the pier if left to run all night. Now if the scope was slewing at 600-1000x sidereal then it would not be good if there was no way for the RA to slip. Would not the latitude play a factor in the angle for a pier crash? I'm at 43 degrees North and I have tried manually slewing at all angles and still did not come close to hitting the pier with a 36" long tube refractor. Hmmm I may try again manually...maybe I missed an angle or something!? Edited by emflocater, 26 January 2019 - 08:47 PM. My 30 year old Pentax MS-5 GEM has a maximum slew rate of 16x sidereal and that was considered very fast in the 1980s.